One of the most amazing images to be able to create on a wedding day is a true silhouette. They are somewhat of a staple for wedding photographers but can be one of the most challenging images to capture with accuracy. The key to silhouettes is ensuring that (1) you have a great back light, and (2) you have enough space between the couple to tell what is going on. For this image, created using the fence at Neuse Breeze Wedding Venue, I used the bride's favorite color - a light teal, which represented the college she graduated from. Placed directly behind them and pointed at the fence, the flash gave the beautiful color to the fence. This is also a great example of having space and connection. 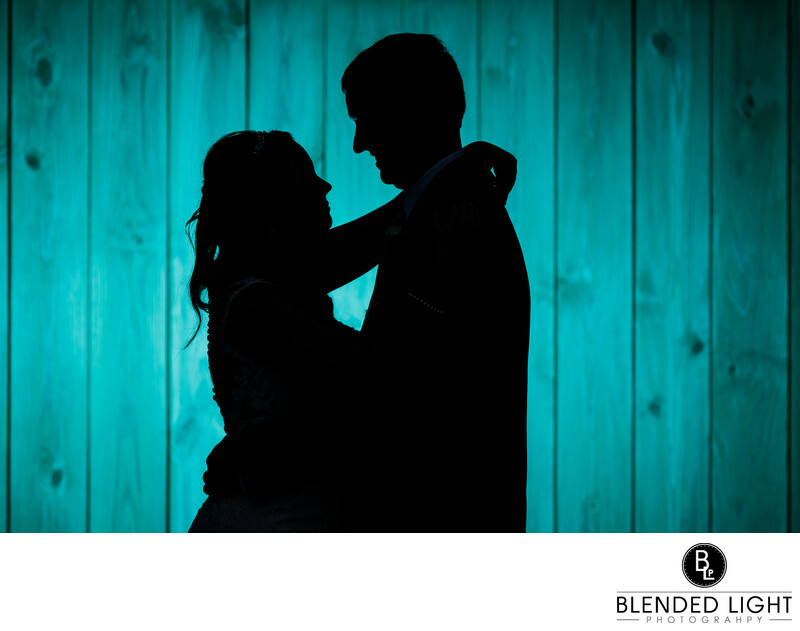 With the bride's arms around her husband's neck and the tightness of their lower bodies, you get a strong connection into what is happening between the couple in the image. At the same time, the space between their up bodies gives some separation and shows 2 distinct outlines rather one continuous shadow. A lot of people uses sunrises or sunsets to create these. Unfortunately on this day it cloudy and very overcast. Mother Nature didn't get the message to provide us with an outstanding show of color to end the day. It was a non-issue though, as we just created something special. Location: Neuse Breeze Wedding Venue, 2391 Temples Point Road, Havelock NC. 1/200; f/4.0; ISO 100; 200.0 mm.